Ok, please tell me my kids aren't the only kids that go through jeans at race car speed. I swear, we just bought new jeans and already the knees are warn out and they are too short for them to wear. 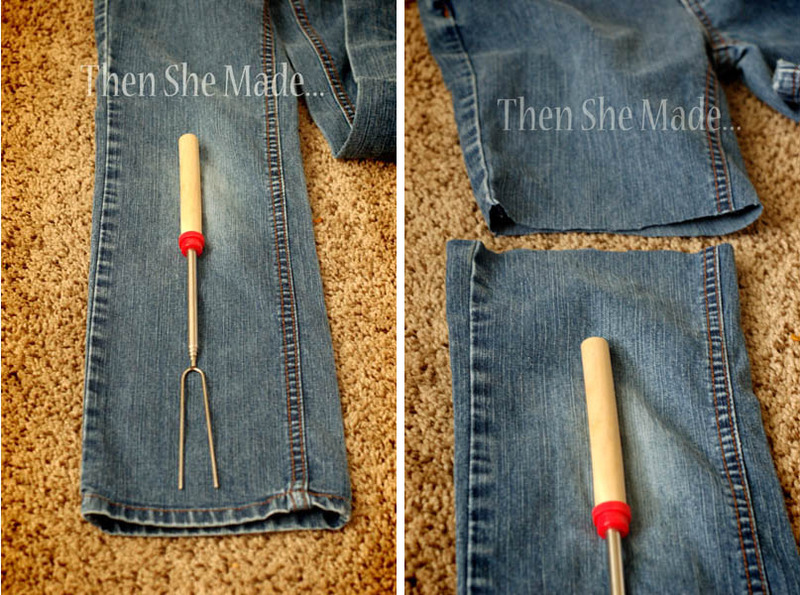 The positive side to all of this is that I have healthy growing kids and jeans I can up-cycle. Oh ya! Bring on the craft project, right? 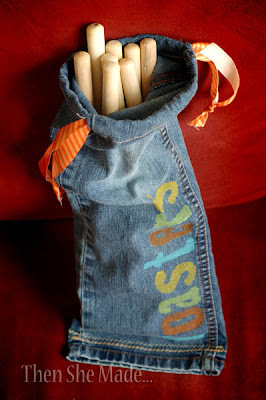 Here's my latest.... a little pant leg bag to hold our roasting sticks. 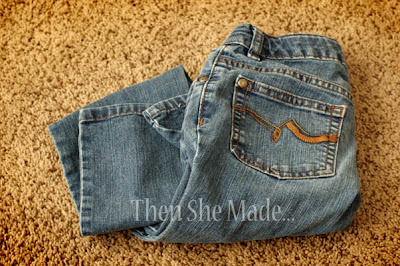 1- Start with a pair of old jeans. They need to be in good enough shape that you can salvage the fabric. 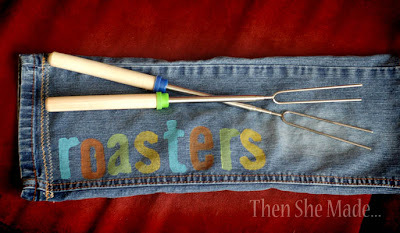 2- Place your roasting stick on the leg of the pant. 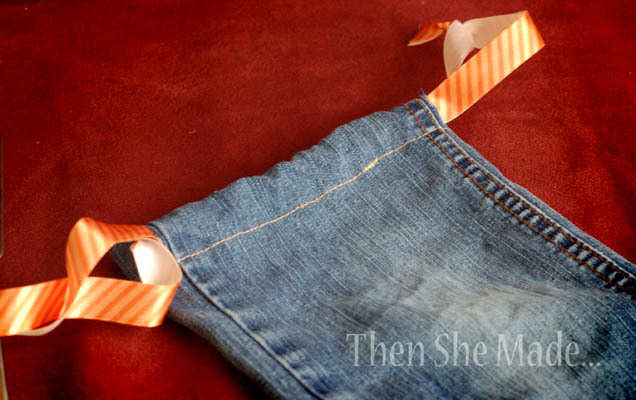 Leave enough space above the stick to be able to sew a 1 inch rolled hem. Then cut. 4- Once the bottom is sewn closed, turn the pant leg inside out and pin the other side of the leg. Normally you'd do a rolled hem, folding it twice, ironing, the whole schabang - I was lazy, I folded it once. It fit my needs. Then I sewed all the way around the opening. This left me with about an inch of a top hem for my ribbon. 5- Next, carefully cut a slit on each side of the bag. 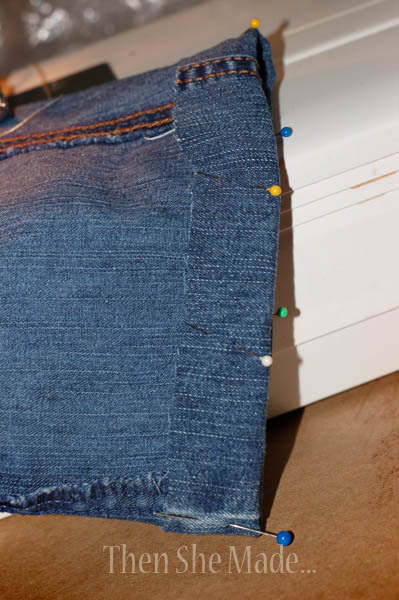 You want each slit to be in-between the edge of the opening and the hem. Don't cut through the hem though. Then thread your ribbon through. I cut two piece of ribbon and threaded them through each side of the hem. Then I tied the edges together with a simple knot. 6-When you are done, you'll have something that looks like the photo above. 7- Technically, I could have stopped there. The bag is done and could be used but I thought it looked a little boring. So, I pulled out my paints and foam stamps and stamped on a label. 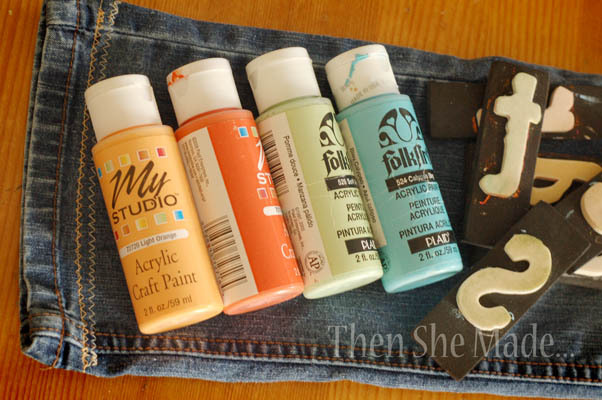 8- Now my little pant leg bag is finally complete. I just need to put all the roasting sticks inside and throw the bag in with the camping gear and I'm set to go! Easy + no cost = the perfect little bag! Love it! I will be making one. Thanks! SU-PER CUTE!!! We have several pairs of old jeans lying around right now in my fabric stash. We don't camp, but you've got me-a-thinkin'! Thanks for sharing. Boy,how clever you are! Love this! Hmmmm...this would also work for my collection of penny whistles and I could stamp "whistles" on the bag. Cute! I stumbled upon your tutorial via pinterest. And I have to ask where did you get your roasting sticks? They are awesome!